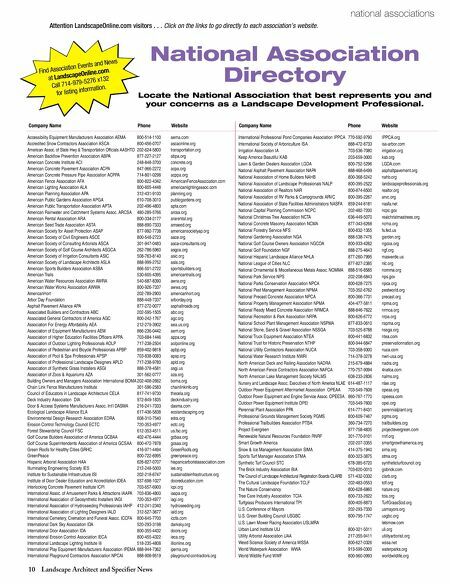 10 Landscape Architect and Specifier News national associations National Association Directory Locate the National Association that best represents you and your concerns as a Landscape Development Professional. 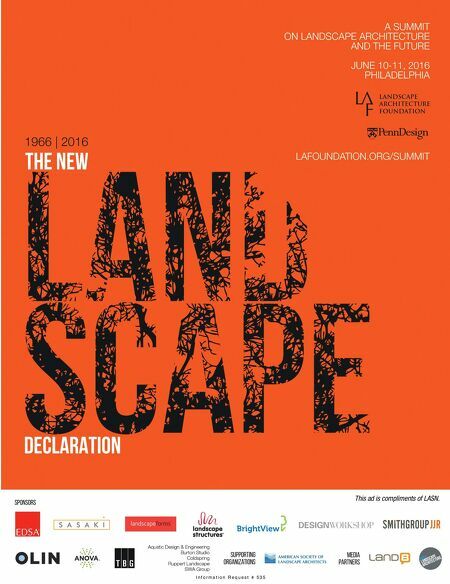 Attention LandscapeOnline.com visitors . . . Click on the links to go directly to each association's website. Company Name Phone Website Company Name Phone Website Accessibility Equipment Manufacturers Association AEMA 800-514-1100 aema.com Accredited Snow Contractors Association ASCA 800-456-0707 ascaonline.org American Assoc. of State Hwy & Transportation Officials AASHTO 202-624-5800 transportation.org American Backflow Prevention Association ABPA 877-227-2127 abpa.org American Concrete Institute ACI 248-848-3700 concrete.org American Concrete Pavement Association ACPA 847-966-2272 acpa.org American Concrete Pressure Pipe Association ACPPA 714-801-0298 acppa.org American Fence Association AFA 800-822-4342 AmericanFenceAssociation.com American Lighting Association ALA 800-605-4448 americanlightingassoc.com American Planning Association APA 312-431-9100 planning.org American Public Gardens Association APGA 610-708-3010 publicgardens.org American Public Transportation Association APTA 202-496-4800 apta.com American Rainwater and Catchment Systems Assoc. ARCSA 480-289-5766 arcsa.org American Rental Association ARA 800-334-2177 ararental.org American Seed Trade Association ASTA 888-890-7333 amseed.org American Society for Asset Protection ASAP 877-992-7738 americansocietyap.org American Society of Civil Engineers ASCE 800-548-2723 asce.org American Society of Consulting Arborists ASCA 301-947-0483 asca-consultants.org American Society of Golf Course Architects ASGCA 262-786-5960 asgca.org American Society of Irrigation Consultants ASIC 508-763-8140 asic.org American Society of Landscape Architects ASLA 888-999-2752 asla.org American Sports Builders Association ASBA 866-501-2722 sportsbuilders.org American Trails 530-605-4395 americantrails.org American Water Resources Association AWRA 540-687-8390 awra.org American Water Works Association AWWA 800-926-7337 awwa.org AmericanHort 202-789-2900 americanhort.org Arbor Day Foundation 888-448-7337 arborday.org Asphalt Pavement Alliance APA 877-272-0077 asphaltroads.org Associated Builders and Contractors ABC 202-595-1505 abc.org Associated General Contractors of America AGC 800-242-1767 agc.org Association For Energy Affordability AEA 212-279-3902 aea.us.org Association of Equipment Manufacturers AEM 866-236-0442 aem.org Association of Higher Education Facilities Officers APPA 703-684-1446 appa.org Association of Outdoor Lighting Professionals AOLP 717-238-2504 aolponline.org Association of Pedestrian and Bicycle Professionals APBP 859-402-9818 apbp.org Association of Pool & Spa Professionals APSP 703-838-0083 apsp.org Association of Professional Landscape Designers APLD 717-238-9780 apld.org Association of Synthetic Grass Installers ASGI 888-378-4581 asgi.us Association of Zoos & Aquariums AZA 301-562-0777 aza.org Building Owners and Managers Association International BOMA 202-408-2662 boma.org Chain Link Fence Manufacturers Institute 301-596-2583 chainlinkinfo.org Council of Educators in Landscape Architecture CELA 817-741-9730 thecela.org Deck Industry Association DIA 972-849-1835 deckindustry.org Door & Access Systems Manufacturers Assoc. Int'l DASMA 216-241-7333 dasma.com Ecological Landscape Alliance ELA 617-436-5838 ecolandscaping.org Environmental Design Research Association EDRA 608-310-7540 edra.org Erosion Control Technology Council ECTC 720-353-4977 ectc.org Forest Stewardship Council FSC 612-353-4511 us.fsc.org Golf Course Builders Association of America GCBAA 402-476-4444 gcbaa.org Golf Course Superintendents Association of America GCSAA 800-472-7878 gcsaa.org Green Roofs for Healthy Cities GRHC 416-971-4494 GreenRoofs.org GreenPeace 800-722-6995 greenpeace.org Hispanic Arborist Association HAA 626-827-0707 hispanicarboristassociation.com Illuminating Engineering Society IES 212-248-5000 ies.org Institute for Sustainable Infrastructure ISI 202-218-6747 sustainableinfrastructure.org Institute of Door Dealer Education and Accreditation IDEA 937-698-1027 dooreducation.com Interlocking Concrete Pavement Institute ICPI 703-657-6900 icpi.org International Assoc. of Amusement Parks & Attractions IAAPA 703-836-4800 iaapa.org International Association of Geosynthetic Installers IAGI 720-353-4977 iagi.org International Association of Hydroseeding Professionals IAHP 412-241-2340 hydroseeding.org International Association of Lighting Designers IALD 312-527-3677 iald.org International Cemetery, Cremation and Funeral Assoc. ICCFA 800-645-7700 iccfa.com International Dark Sky Association IDA 520-293-3198 darksky.org International Door Association IDA 800-355-4432 doors.org International Erosion Control Association IECA 800-455-4322 ieca.org International Landscape Lighting Institute illi 518-235-4808 illionline.org International Play Equipment Manufacturers Association IPEMA 888-944-7362 ipema.org International Playground Contractors Association NPCAI 888-908-9519 playground-contractors.org International Professional Pond Companies Association IPPCA 770-592-9790 IPPCA.org International Society of Arboriculture ISA 888-472-8733 isa-arbor.com Irrigation Association IA 703-536-7080 irrigation.org Keep America Beautiful KAB 203-659-3000 kab.org Lawn & Garden Dealers Association LGDA 800-752-5296 LGDA.com National Asphalt Pavement Association NAPA 888-468-6499 asphaltpavement.org National Association of Home Builders NAHB 800-368-5242 nahb.org National Association of Landscape Professionals NALP 800-395-2522 landscapeprofessionals.org National Association of Realtors NAR 800-874-6500 realtor.org National Association of RV Parks & Campgrounds ARVC 800-395-2267 arvc.org National Association of State Facilities Administrators NASFA 859-244-8181 nasfa.net National Capital Planning Commission NCPC 202-482-7200 ncpc.gov National Christmas Tree Association NCTA 636-449-5070 realchristmastrees.org National Concrete Masonry Association NCMA 877-343-6268 ncma.org National Forestry Service NFS 800-832-1355 fs.fed.us National Gardening Association NGA 888-538-7476 garden.org National Golf Course Owners Association NGCOA 800-933-4262 ngcoa.org National Golf Foundation NGF 888-275-4643 ngf.org National Hispanic Landscape Alliance NHLA 877-260-7995 masverde.us National League of Cities NLC 877-827-2385 nlc.org National Ornamental & Miscellaneous Metals Assoc. NOMMA 888-516-8585 nomma.org National Park Service NPS 202-208-6843 nps.gov National Parks Conservation Association NPCA 800-628-7275 npca.org National Pest Management Association NPMA 703-352-6762 pestworld.org National Precast Concrete Association NPCA 800-366-7731 precast.org National Property Management Association NPMA 404-477-5811 npma.org National Ready Mixed Concrete Association NRMCA 888-846-7622 nrmca.org National Recreation & Park Association NRPA 800-626-6772 nrpa.org National School Plant Management Association NSPMA 877-833-0610 nspma.org National Stone, Sand & Gravel Association NSSGA 703-525-8788 nssga.org National Truck Equipment Association NTEA 800-441-6832 ntea.com National Trust for Historic Preservation NTHP 800-944-6847 preservationnation.org National Utility Contractors Association NUCA 703-358-9300 nuca.com National Water Research Institute NWRI 714-378-3278 nwri-usa.org North American Deck and Railing Association NADRA 215-679-4884 nadra.org North American Fence Contractors Association NAFCA 770-757-9094 4nafca.com North American Lake Management Society NALMS 608-233-2836 nalms.org Nursery and Landscape Assoc. Executives of North America NLAE 614-487-1117 nlae.org Outdoor Power Equipment Aftermarket Association OPEAA 703-549-7608 opeaa.org Outdoor Power Equipment and Engine Service Assoc. OPEESA 860-767-1770 opeesa.com Outdoor Power Equipment Institute OPEI 703-549-7600 opei.org Perennial Plant Association PPA 614-771-8431 perennialplant.org Professional Grounds Management Society PGMS 800-609-7467 pgms.org Professional Trailbuilders Association PTBA 360-734-7270 trailbuilders.org Project Evergreen 877-758-4835 projectevergreen.com Renewable Natural Resources Foundation RNRF 301-770-9101 rnrf.org Smart Growth America 202-207-3355 smartgrowthamerica.org Snow & Ice Management Association SIMA 414-375-1940 sima.org Sports Turf Manager Association STMA 800-323-3875 stma.org Synthetic Turf Council STC 678-385-6720 syntheticturfcouncil.org The Brick Industry Association BIA 703-620-0010 gobrick.com The Council of Landscape Architectural Registration Boards CLARB 571-432-0332 clarb.org The Cultural Landscape Foundation TCLF 202-483-0553 tclf.org The Nature Conservancy 800-628-6860 nature.org Tree Care Industry Association TCIA 800-733-2622 tcia.org Turfgrass Producers International TPI 800-405-8873 TurfGrassSod.org U.S. Conference of Mayors 202-293-7330 usmayors.org U.S. Green Building Council USGBC 800-795-1747 usgbc.org U.S. Lawn Mower Racing Association USLMRA letsmow.com Urban Land Institute ULI 800-321-5011 uli.org Utility Arborist Association UAA 217-355-9411 utilityarborist.org Weed Science Society of America WSSA 800-627-0326 wssa.net World Waterpark Association WWA 913-599-0300 waterparks.org World Wildlife Fund WWF 800-960-0993 worldwildlife.org Find Association Events and News at LandscapeOnline.com. Call 714-979-5276 x132 for listing information.